FET has very high input impedance and it is the main advantage of the device. It has an input impedance on the order of 100 Mega ohms or more. Its input and output are isolated and less noisy making them ideal for FM receivers. Another important feature is that, it is immune to radiation and exhibits no Offset voltage at Zero drain current so as to make it a good signal chopper. In structure, FET is a charge carrier and has an active channel through which the charge carriers called electrons and holes flow. The flow of charge carrier is from Source (Similar to Collector) to the Drain (Similar to Emitter).The Source and Drain terminals are connected in the semiconductor through Ohmic contacts. The conductivity of the channel depends on the potential applied to the Gate terminal in reference to the Source. 1. Source (S) – through which the majority carriers enter the channel. The current entering at S is designated as IS. 2. Drain (D) – through which the majority carriers leave the channel. The current entering the channel at D is designated as ID and the Drain to Source voltage as VDS. 3. 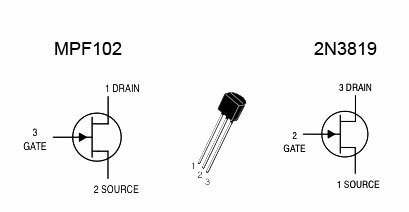 Gate (G) – This terminal modulates the channel conductivity. By applying voltage to G, one can control ID. The Gate terminal controls the opening and closing of a physical gate. This gate permits electrons to flow through or blocks their passage by creating or eliminating a channel between the source and drain. Electrons flow from the source terminal towards the drain terminal if influenced by the applied voltage. The Gate, Drain, and Source terminals correspond roughly to the base, collector, and emitter of a Transistor. Most FETs also have a fourth terminal called the Body or Substrate. It is also called as Shield. This terminal serves to Bias the FET. Usually the body terminal is connected to the highest or lowest voltage within the circuit, depending on the type or remains unconnected. MOSFET is the Metal Oxide Semiconductor Field Effect Transistor used for switching applications or to amplify signals. In the MOSFET, a voltage applied to its oxide- insulated gate to induce a conducting channel between the Source and Drain electrodes. This causes the flow of current. 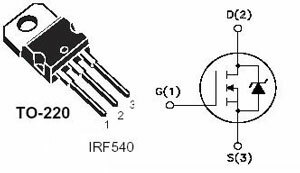 The channel may be n-type or p-type and based on this, MOSFETs may be n-MOSFET or p-MOSFET. Previously, metal was used in the gate but now Polysilicon is used in the gate but the efficiency is more in metal made gate channel. The source and drain contacts are made using Aluminium and the rest of the substrate surface is covered with thin oxide film. The gate electrode is laid on the top of the insulating oxide layer. The oxide film contains Silicon dioxide( SiO2) .The p- substance is lightly doped so it has high resistance and prevents the passage of current from source to drain if there is no gate voltage. MOSFETs are voltage controlled power devices driven by current. If a positive voltage is applied between the gate and source, MOSFET, the positive voltage push away the holes in the p-substance and attracts the electrons in the n- substance under the source and drain electrodes. This creates a channel under the gate insulator through which electrons move from source to drain. Increased gate voltage further increases the thickness of the channel which increases the current flow. Due to this property, the MOSFET is said to be an enhanced mode device. Since the p- substance is thin, even a small gate potential can cause current flow from source to drain. Gate electrode is positively charged and repels the holes in the p-substance so the p- region curve so many electrons accumulate in the conduction band. The most important aspect of FET and MOSFET is their sensitivity. Most devices are static sensitive and even a single touch on its pins can damage the device due to static electricity in the hand. So antistatic measures are necessary to handle the device. 1. One simple tip is to touch the pins of FET and MOSFET using a Plier to discharge any accumulated static charge before soldering. When radiation hits the MOSFET, channel inversion takes place and the device creates off state leakage path and turns on. 2. While storing, it is better to twist the gate pin with Source or Drain pin to avoid charge accumulation in the gate. It is better to keep the device on a thermocol with the pins pushed into it. 3. Do not apply excess heat while soldering to avoid instant damage. A single touch with soldering iron is ideal.